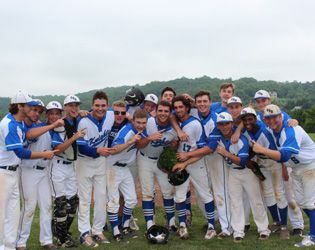 George Stiuso '16 tossed a masterful five-hit, nine-inning complete game to lead the GSB varsity baseball team to a 2-1 victory over Holy Spirit on Friday in the NJSIAA Non-Public B South sectional semifinals. With the game tied at one in the bottom of the ninth, Ryan Chestnutt '16 led off with a single, went to second on a sacrifice bunt by Neil Ianniello '16, and advanced to third on a base hit from A.J. Donofrio '19. That set up a dramatic game winning hit by Danny Sivolella '16 to send the Knights (19-10) to their first-ever sectional final. Ryan Morash '18 went 2-for-3 and Matt Taylor '16 blasted an RBI double in the fourth. The Knights will face Holy Cross on Tuesday at 4:00 p.m. at Rutgers University for the sectional title and the opportunity to play for a state championship next Saturday.